My Artist-In-Residence Program project proposal was to compare landscapes from images taken around the the time of the Park’s dedication in 1915 to the same landscapes today. Interesting project for me. Changes really aren’t extensive, mostly reforestation, and some succession from grass meadows to shrubbery. Generally less snow cover on peaks, but that could be due to minimal snow fall last winter and a warm spring and summer as much as to climate change. BioBlitz is neat; second session this afternoon. In a BioBlitz, scientists and helpers do a 24 hour diversity study, finding as many different species as possible. National Geographic and the iLCP (the International League of Conservation Photographers – www.ilcp.com ) are participants with many local scientists. Six iLCP members gave a very interesting presentation in the evening. Although the imagery was great, there was more focus on the conservation activities, including projects on fishing cats in Thailand (Morgan Heim, Colorado), the impact of the border wall on wildlife at the Texas/Mexico border (Krista Schlyer, DC), working on conservation projects with young people (Kevin Fitzpatrick, Asheville, NC), highlands and frogs in South America (Joe Riis), human wildlife interactions (Karine Aigner), and macrophotography combined with an international net-based program at www.meetyourneighbours.net (yes the “u” is correct and it is net not com), that explores the more common animals and plants that you can see in your neighborhood. Good mix of real science with public education and fun. I did a workshop with youngsters on “Create a Creature” a lesson on adaptation that seemed particularly appropriate to activities on biodiversity. Finally got some decent light and skies after a storm. 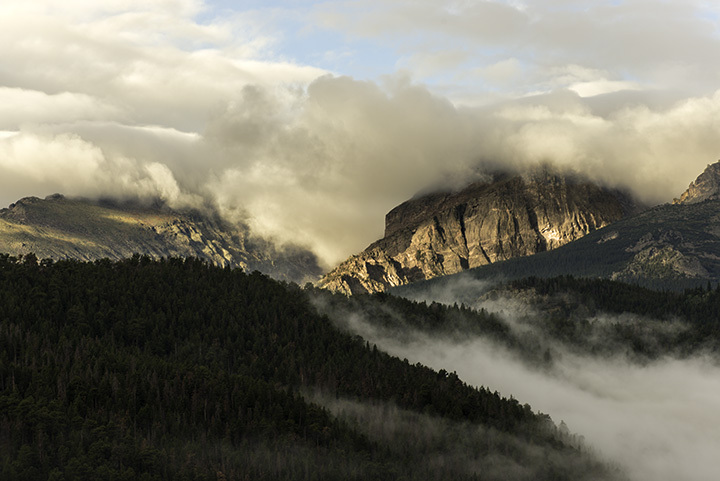 Hallett’s Peak from William White Cabin, Rocky Mountain National Park. These are some of the elk that caused the elk jam. 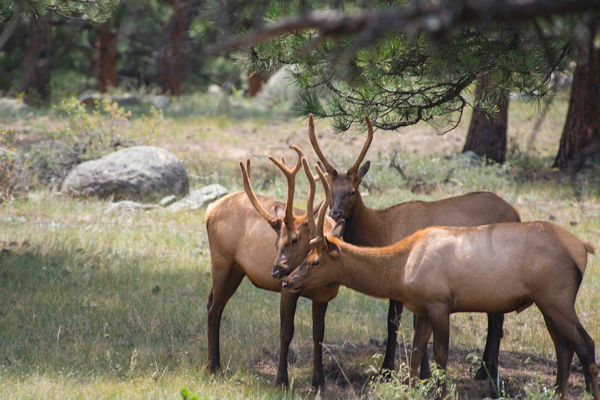 Elk are too common in the park and have caused significant damage to aspen and willow trees. During the winter, the elk scrape the bark for food, and can girdle the tree, killing it. In some areas, 30 acre exclosures keep the elk out so the trees can recover. There is about 18″ of ground clearance so small animals are not hindered. 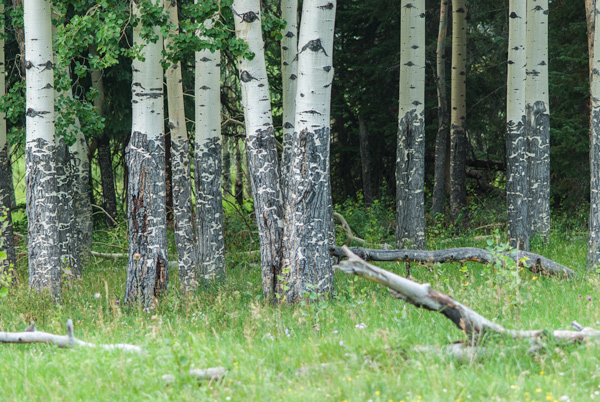 Below is an example of aspens damaged by winter elk browsing. 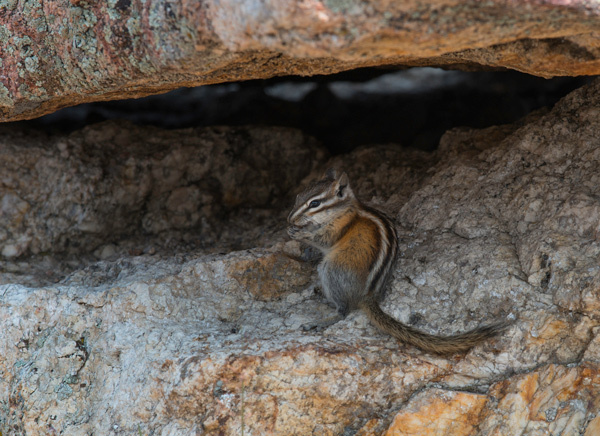 Golden mantled ground squirrel, least chipmunk and Clark’s nutcracker. The ground squirrel and chipmunk are really fast little rascals. They are very used to people and show little fear. One practically ran over my feet the other day. It was so fast, I am not sure which of them it was. 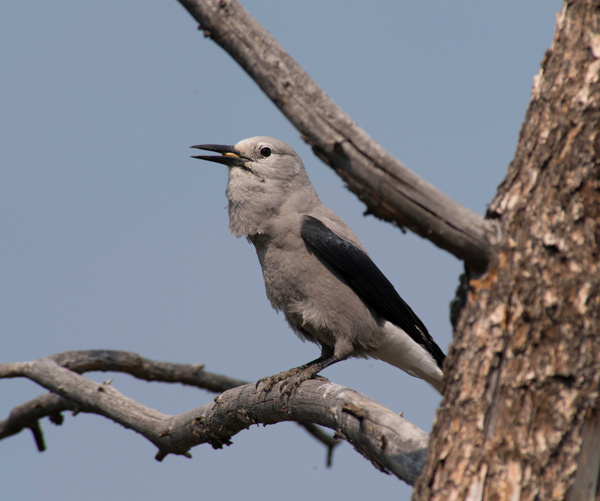 The Clark’s nutcracker and Stellars Jay are both about the same size and fairly common. I am still looking for a good image of the jay. I gave my first (of two) presentation last night. About 80 people attended and it seemed to go well. Yesterday I really got out to shoot a lot more. The haze from forest fires is noticable, and nothing at a great distance (like mountain peaks) seems really sharp. Not much I can do about it. For the project to compare scenes photographed in the 1920’s, about the time of the Park’s dedication in 1915 to the same scene today, I finally managed to locate two. The historic images often aren’t well documented, but with some local help, I matched up to two USGS images. Will post more images after they are reviewed and documented. Experienced my first “Elk Jam” today — When an elk herd grazes by the road, everyone stops for a peek and a photo until the road backs up. Just like rubber-necking at home. More pictures on Sunday. On Sunday afternoon there were tons of wildlife: two deer, a coyote that looked at my car as if to ask “where the hell did this come from,” a hummingbird, a chipmunk and a ground squirrel (looks like an over-sized chipmunk, but was so fast I only got a blur). 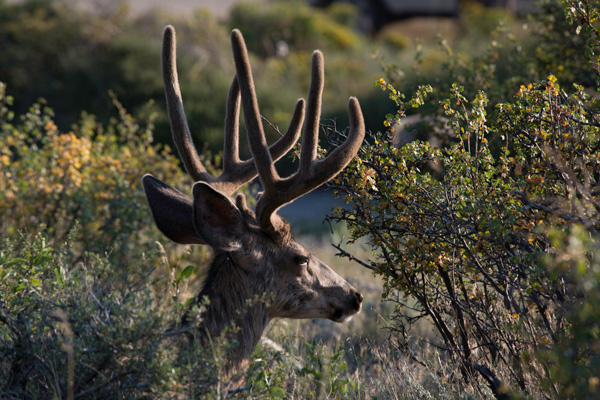 This is probably a mule deer. Two of them stayed and ate and chewed on the hill leading up to the cabin. 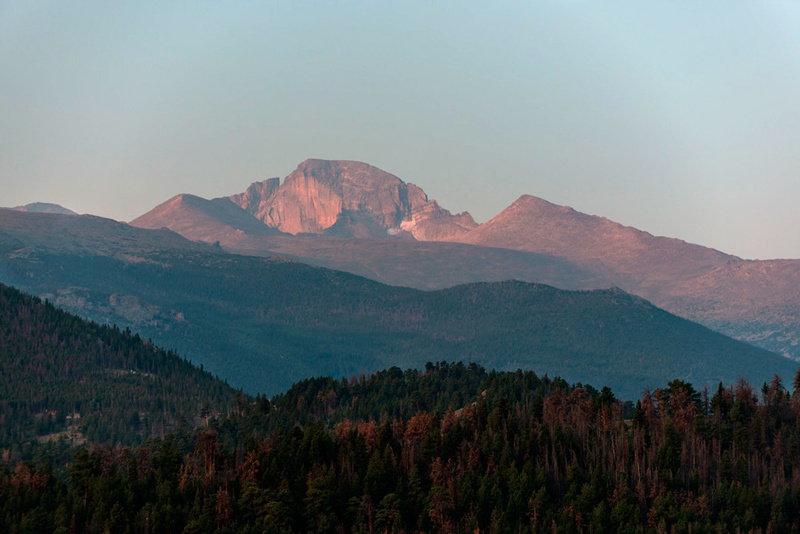 Longs Peak is the view directly from porch. There are at least 16 major peaks. I did a panorama, but need to re-do as there is too much haze. The haze gets bad in the afternoon. This was taken right after sunrise. This is the cabin where I am staying. 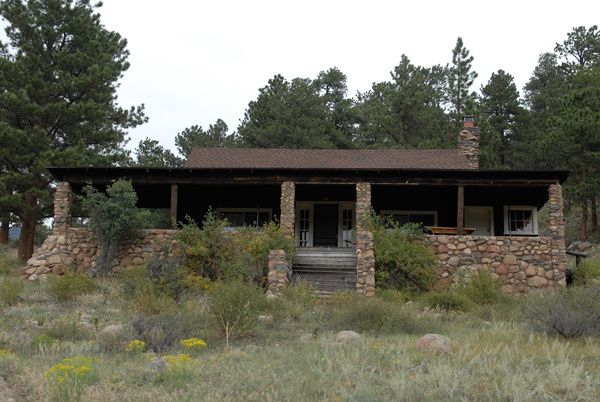 It is down Bear Lake Road from the Moraine Park visitors center.